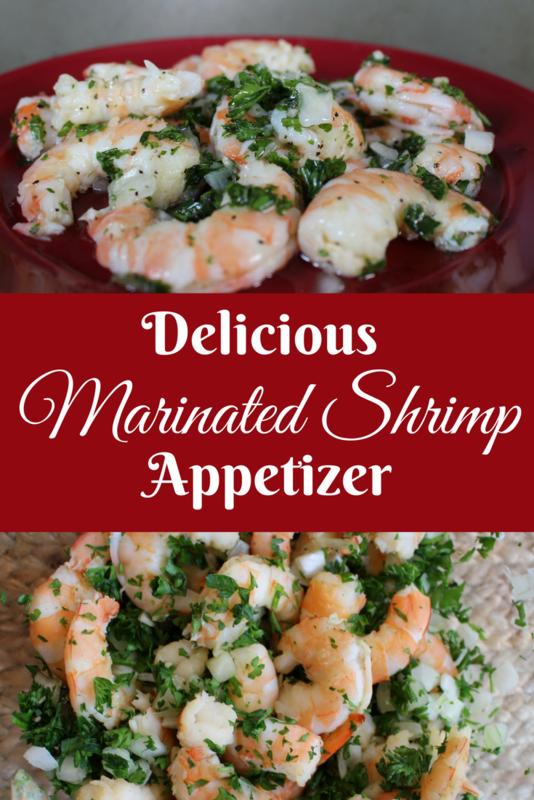 My mom’s Delicious Marinated Shrimp Appetizer is to die for! Even though I must have pinned a thousand recipes on Pinterest, I always go back to these tried and true recipes that I’ve had for years. As you can see from this picture – I’ve had the recipe many years – over 30 at least. 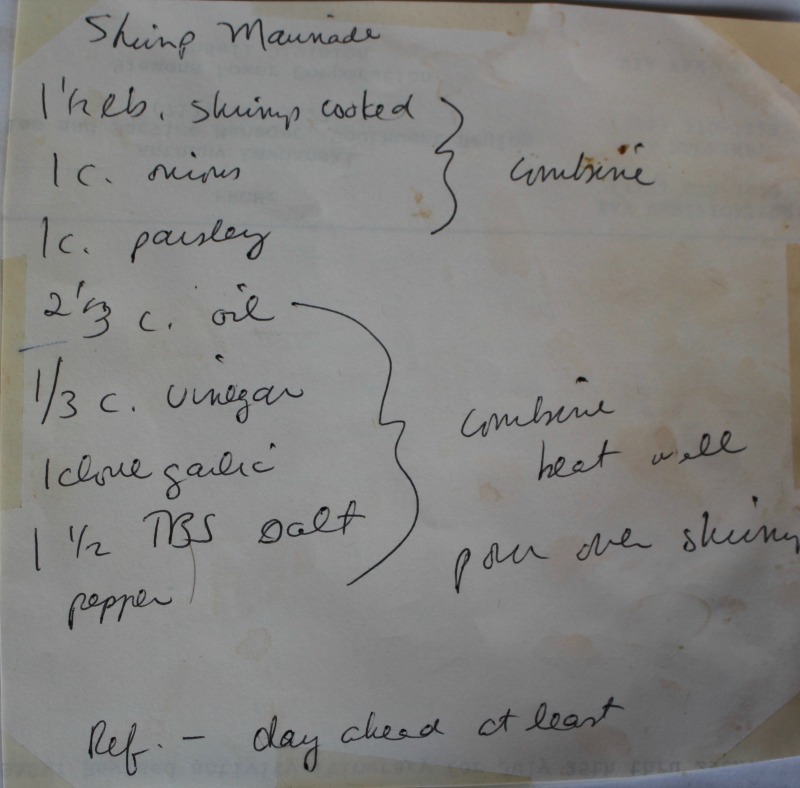 I copied Mom’s recipe on a scrap piece of paper and it’s stayed in that form for all this time! Since we live on the Texas Gulf Coast, we can get fresh shrimp pretty much year round. And since my family loves shrimp – we eat a LOT OF IT. This recipe, like most that I make often, is easy peasy and great to make ahead of time. Give it a try! I don’t think I’ve ever boiled one shrimp in my life without Zatarain’s. It’s just the best. You can get it in smaller packages, but I get it by the tub! Shrimp can be kind of bland if you just boil it in plain water. Cooking it with Zatarain’s to start adds a great base of flavor to the entire recipe. And they are not paying me to say this! I just love Zatarain’s! 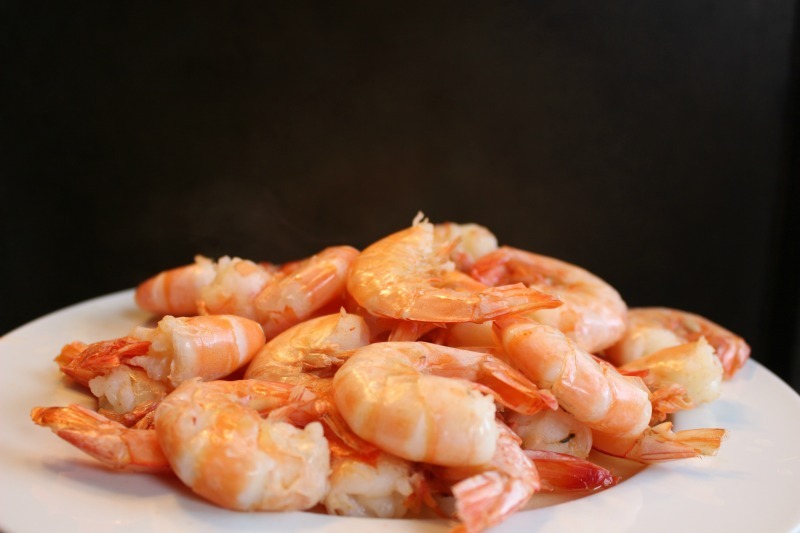 Tip: Here’s how to tell if your shrimp is done and how to not overcook it – put your shrimp in seasoned boiling water. When it floats to the top, it’s done. Here’s what the shrimp looks like when they are done. Such a pretty pink color. Cool and peel. Chopped up onions and parsley. 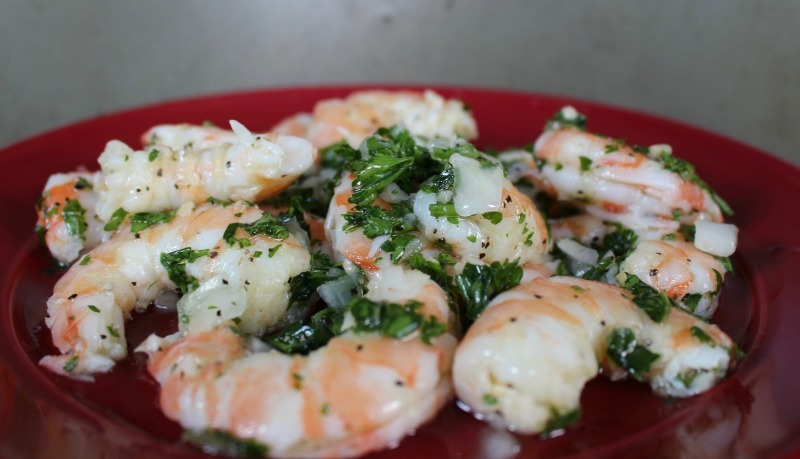 Mix cooled and peeled shrimp with the onions and parsley. 1-1/2 TBS. salt. Yes, that is TABLESPOON. And your blood pressure will go up, but use this amount anyway. It won’t taste too salty. And for the other reasons, see #1 above. Beat ingredients well to combine. Pour over shrimp mixture. Refrigerate overnight. Remove from bowl with a slotted spoon to a pretty serving platter and serve with toothpicks. So the shrimp would show up well in the pictures, I used a round, red plate. But when I serve it, I like to put the shrimp on a pretty rectangular platter like this. 1 TBS. coarse ground pepper. Boil shrimp in Zatarain’s according to package directions. Cool and peel. 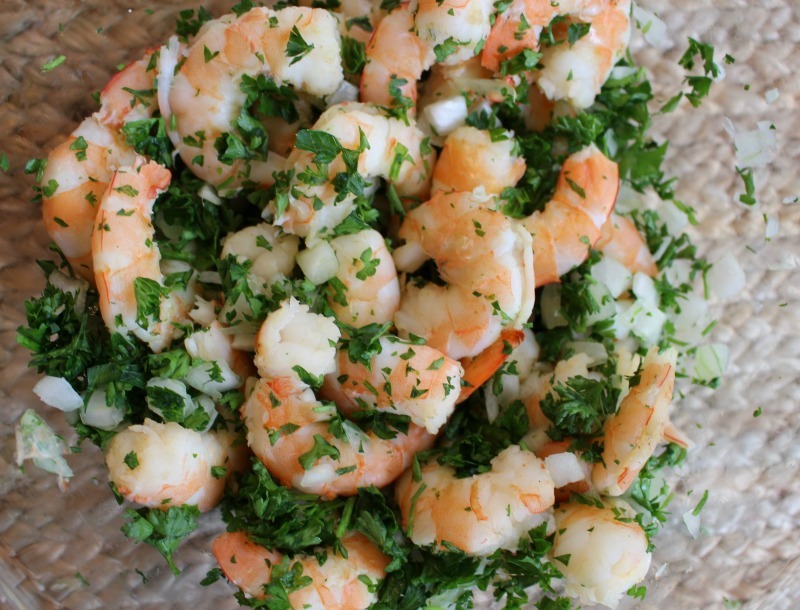 Mix peeled shrimp, onion and parsley in a large mixing boil. Mix remainder of ingredients together to make the marinade and pour over shrimp mixture. 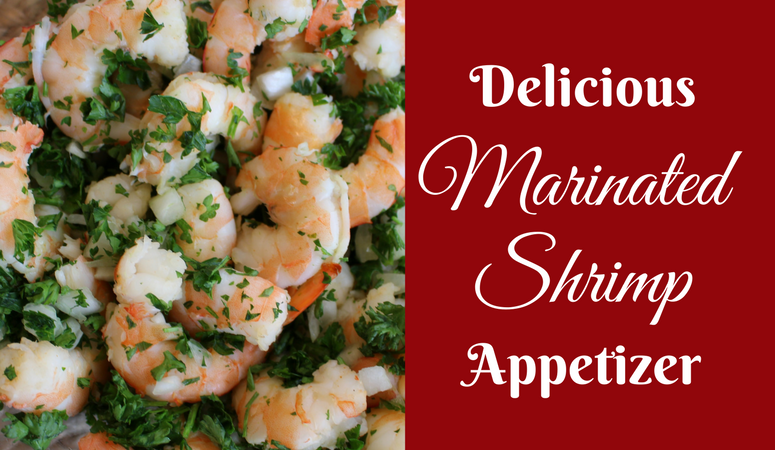 To serve, use a slotted spoon to transfer shrimp to a serving tray and serve with toothpicks. 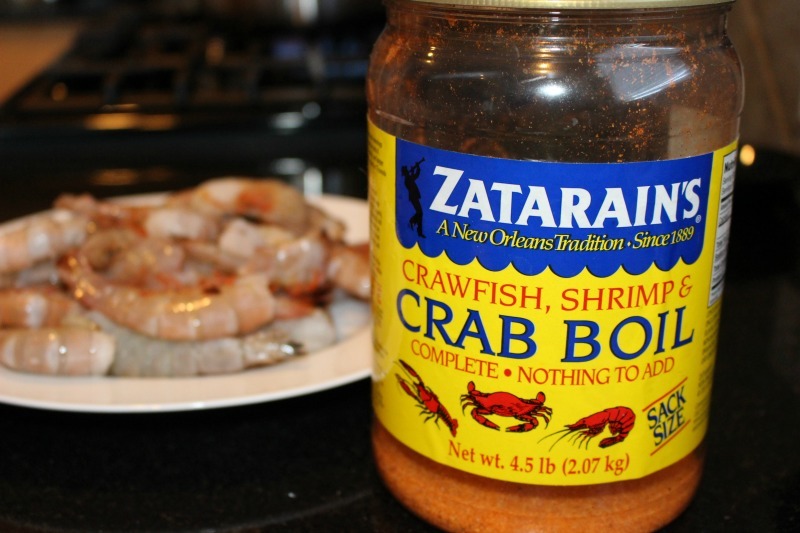 I’ve never tried Zatarains Crab Boil; putting that on my shopping list! Drool alert!!!! This sounds delicious Cathy. Shrimps are one of my favs. I wonder if we can get Zatarains here in South Africa? I don’t know, but any spicy mixture to cook the shrimp in would be great! You’ll love this recipe! I have never tried Zatarinas before, I usually use Old Bay. Love shrimp any way. Have some in the freezer and need to try this. ade these tonight for dinner – they were a hit! Can’t wait to make them again! We love Zatarain’s too! Such a great flavor added while boiling. I love any step that isn’t really an extra step, makes preparation quick and easy. These look so delish. Saving the recipe to make in the future. BTW, love seeing the recipe in it’s original copied form, love the scraps that I have inherited along the way and will pass them to my kids. New to me, it looks awesome! I need to try it..
Cathy I can’t wait to try this recipe. I pinned it so the next time we are visiting our daughter in Fl I can make it for them. 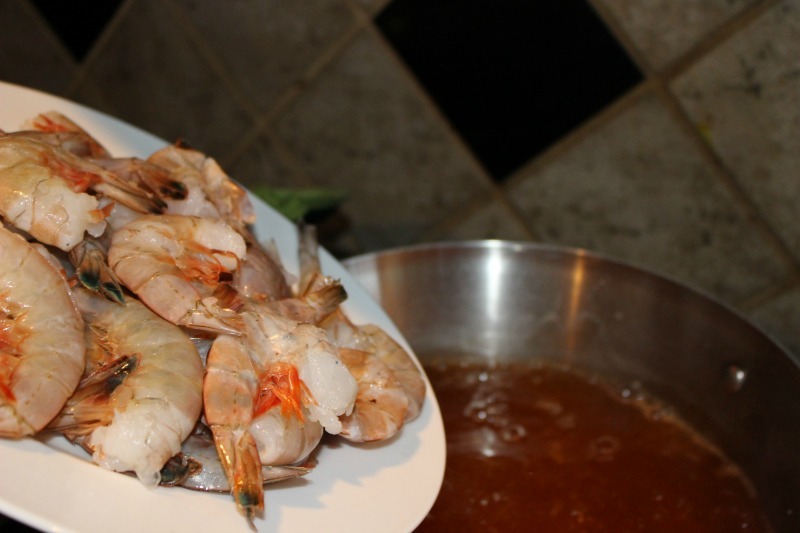 It is best with fresh shrimp, so it will be so delicious when you make it in Florida! We love our shrimp on the Gulf Coast. That rates a big ole yum! Must try this!! Lisa – it is delicious! Let me know how you like it!